RAWALPINDI: Sri Lankan Army Commander Mahesh Senanayaka on Monday acknowledged Pakistan’s efforts to maintain peace in the region by fighting against terrorism. This compliment was made in a meeting of the Sri Lankan army commander and Army Staff General Qamar Javed Bajwa at the General Headquarters in Rawalpindi. According to an Inter-Services Public Relations (ISPR) statement, the COAS and Sri Lankan Army Commander discussed matters of mutual interest during the meeting. Commander Senanayaka expressed his country’s appreciation for Pakistan’s unequivocal moral and material support during Sri Lanka’s own war on terror. Besides the meeting, the Sri Lankan commander was presented with a guard of honour upon his arrival at the GHQ and he laid a wreath at Yadgar-e-Shuhada. Earlier on January 16, the COAS during a two-day official visit to Sri Lanka on the invitation of his counterpart had commented that Pakistan and Sri Lanka were probably the only countries which understood what it takes to defeat terrorism. 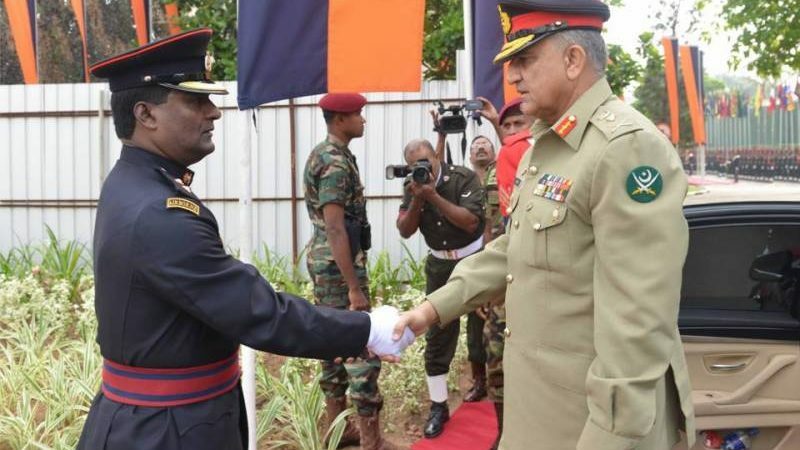 During general Bajwa’s visit there, he met with the Sri Lankan military leadership including the chief of defence staff, and the chiefs of all three services after which he visited the Command and Staff College Sri Lanka and interacted with the faculty and staff. The COAS had highlighted that having cleared every nook and corner from terrorists, Pakistan is now going after their disorganised residual presence under Operation Radd-ul-Fasad.